When veterans of America's two current wars  Iraq and Afghanistan  tried to sue the Department of Veterans Affairs for failing to process thousands of claims for post traumatic stress disorder (PTSD), the Department waved them off saying they had no right to do so. The VA said that Congress had set up an administrative  not judicial  process for evaluating individual disability claims. The veterans, it declared, just had to wait for bureaucracy to take its course  no matter that it has a backlog of 600,000 unresolved claims, each of which can take up to six months or more to process. Now, however, a federal judge in San Francisco has cleared the way for a dramatic challenge to the constitutionality of the VA's claims system. Judge Samuel Conti of the Northern District of California ruled that the administrative system is not "adequate" for reviewing claims of organizations suing on behalf of a broad class of veterans (the class-action lawsuit was filed in July by two veterans organizations). 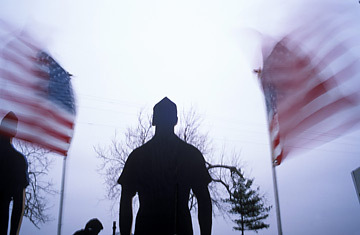 Nor is that bureaucratic process empowered to grant the kind of relief sought by the veterans groups: systemic changes in the VA's processing of disability claims, strengthened rights of individual veterans to press their claims and immediate medical and psychological help for returning troops complaining of PTSD symptoms. The suit claims that the VA violates the constitutional rights of PTSD victims by denying them medical care and benefits as well as the power to hire outside attorneys and obtain records in their disability petitions. Proponents of the suit point out that the VA's immense backlog of claims leads to delays in treatment, often compounding PTSD symptoms, contributing to substance abuse and suicide. "VA first mistreated hundreds of thousands of veterans, then took the position that the vets could not bring their grievances to court to be heard," said Melissa Kasnitz, whose non-profit law firm, Disability Rights Advocates, represents the veterans groups. "Today, VA's shameful effort to keep these deserving veterans from their day in court was rejected." Of 750,000 veterans of the Iraqi and Afghanistan wars, the suit says, at least 15% suffer from PTSD, an emotional illness characterized by nightmares, memory loss and irritability. The VA's failure to provide treatment  only 27 of the nation's 1,400 VA hospitals have programs dedicated to PTSD  has led to an "epidemic of suicides" by returning troops, said Paul Sullivan of Veterans for Common Sense, the lead plaintiff group. The VA declined comment on the Conti decision, but issued a statement saying it is "dedicated to meeting the mental health care needs of all veterans." It noted an increase in its mental health care staff and creation of new programs to treat returning soldiers. Judge Conti scheduled a Feb. 22 hearing to consider arguments by plaintiffs to stop the VA from turning away suicidal vets and from withholding funds appropriated by Congress for mental health treatment of veterans.